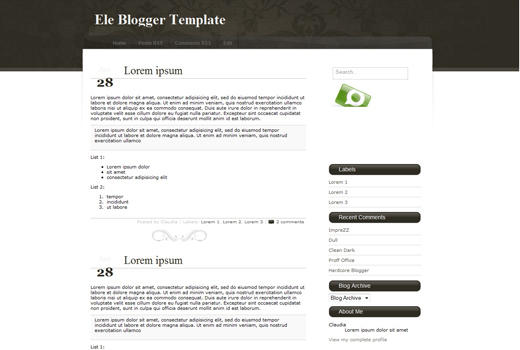 Ele blogger template for free download on Blogger Templates. that’s a very cool template, but for some reason the dates don’t show. The template is working fine, follow the instructions below. After login, go to Layout > Page Elements > edit Blog Posts > change time format to long date (e.g Wednesday, June 17, 2009). Remember, change time format NOT date format. It would be the 3rd field. I love to use this template for my blog. But can you please help me set it up for a 3 column template? I’ll be forever be grateful if you can. LOVE this layout but when people try to comment and need to enter the verification word it wont let them scroll thus not allowing them to comment. Anyway to fix this? Not quite sure if I am getting what you mean, I can comment on it. Can you add your blog in the website field of the comments so I can have a look. I don’t know why, but this site is sick. They put link for the instruction, but i will bring you back to home. Hi, Ive been having TONS of difficulties trying to get the code. I downloaded the layout but when I click on the document it just says connecting on internet explorer and It won’t give me the code. Thank you id appreciate any help. Are you using Blogger HTML Classic or XML version? After you downloaded it you need to unzip it using winzip, winrar or 7zip which you can download for free. After that you will see Ele.xml which is the file you upload directly to your blogger dashboard -> Layout -> Edit HTML.